Hello! I am Yakun Chen and I am a digital media designer in US. Though I usually work digitally and play with mediums that are mostly controlled by computers, I love board games! The shape, the texture, the colorful paint of the game bits, the boards and the cards always invoke my desire to touch and grab them like a baby. Blue board is for the acrobats; green board is for the animals; iridescent board is for the clowns; purple-orange board is for the magician. I made this Mystery Circus about one year ago. It’s a 4-player asymmetrical game that has four kinds of characters in it: magician, clown, animal and acrobat. 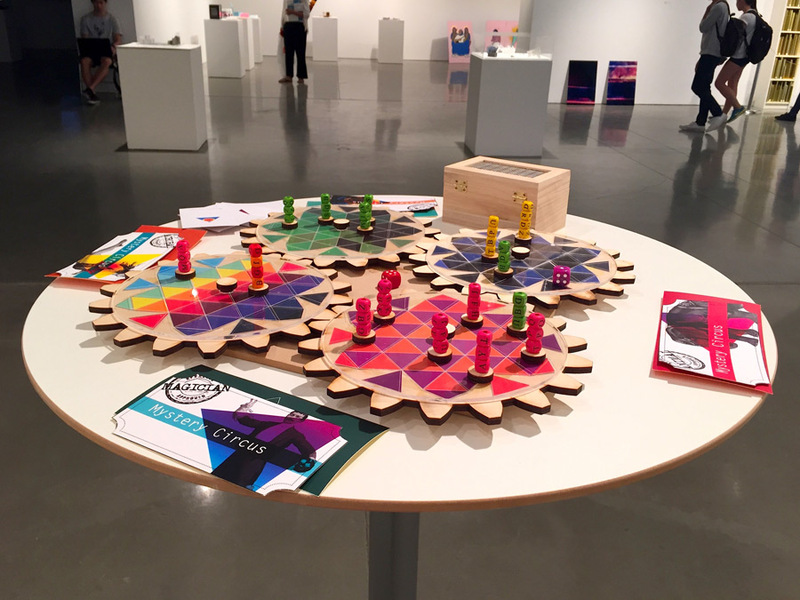 Each player controls on kind of the characters and occupies one circular board. It’s ‘mysterious’ partially because before starting the game, each player will receive a sealed envelope in which a ticket indicates your character. 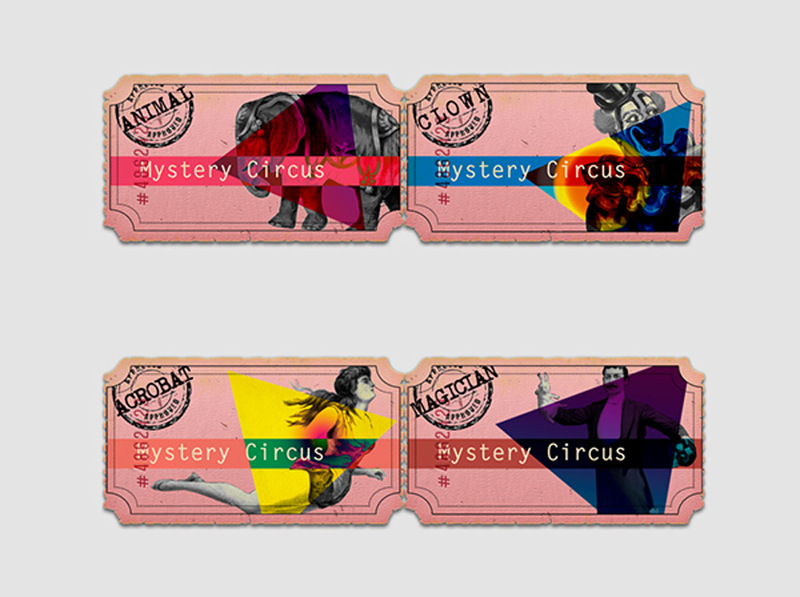 Identity tickets for four characters: Acrobat, Magician, Animal, and Clown. From this moment, you become the only magician of this Mystery Circus. To ensure your safety, please use your powers appropriately. •	When you are next to an acrobat, you can paralyze him. •	When you are next to an animal, you can change it into a magician that has the same abilities as you. •	When you are next to a clown, you can do nothing. Hey, you are the animals of this Mystery Circus. You have 6 members! To protect them, remember to use your powers wisely. •	When you are next to an acrobat or a clown, you can kill him and occupy its position. Brilliant! 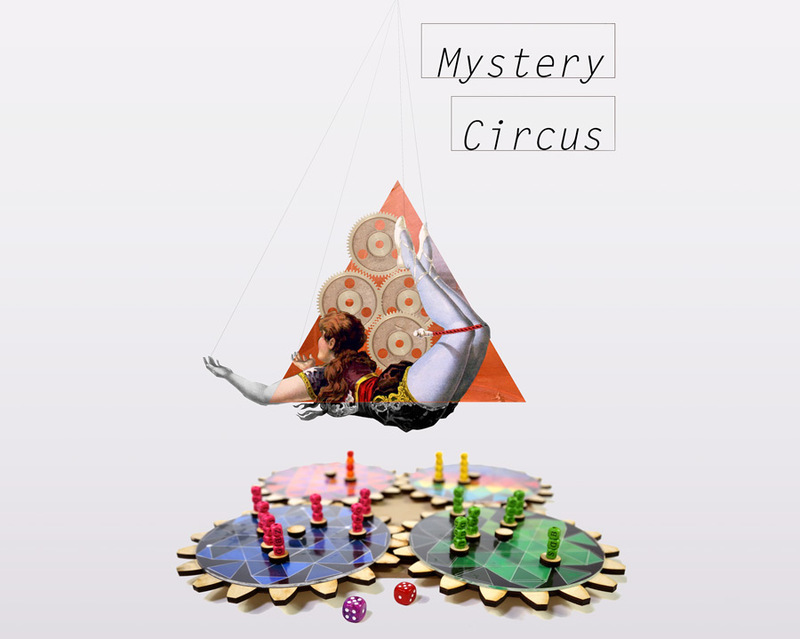 You are the acrobats of this Mystery Circus. You get a 7-person team. For safety, do not misuse your power! 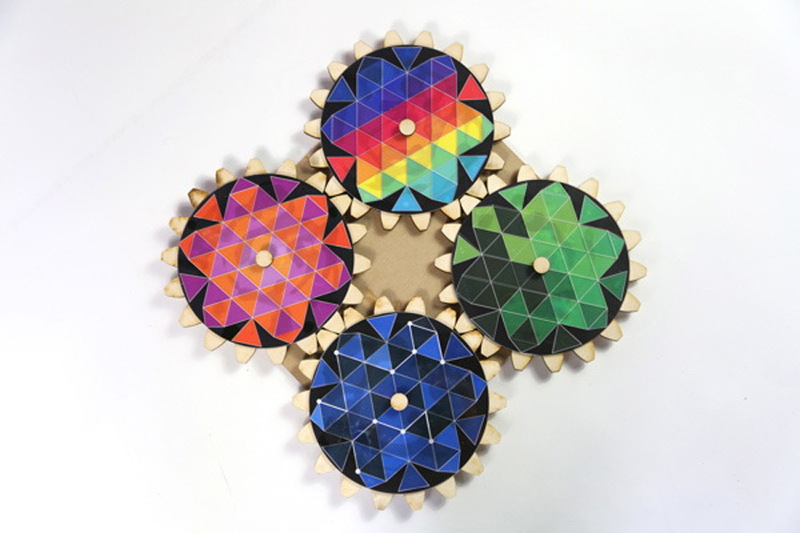 •	If you roll 1, 3, 5, you can move double steps. •	You can’t kill anyone. Congratulations! You now have 2 clowns in this Mystery Circus. Try to use your powers at the right time to protect them! •	You have eight cards. Most of them can drag you out of troubles and dangers. •	When you are next to someone, you can choose to check a card. •	If you check a card, please follow its instruction. Players win by being the first one to occupy the diagonal board (kill or drive any other characters out of this board, and have all your left bits on it). The differences in power and number of different characters are to maintain a balance component system. 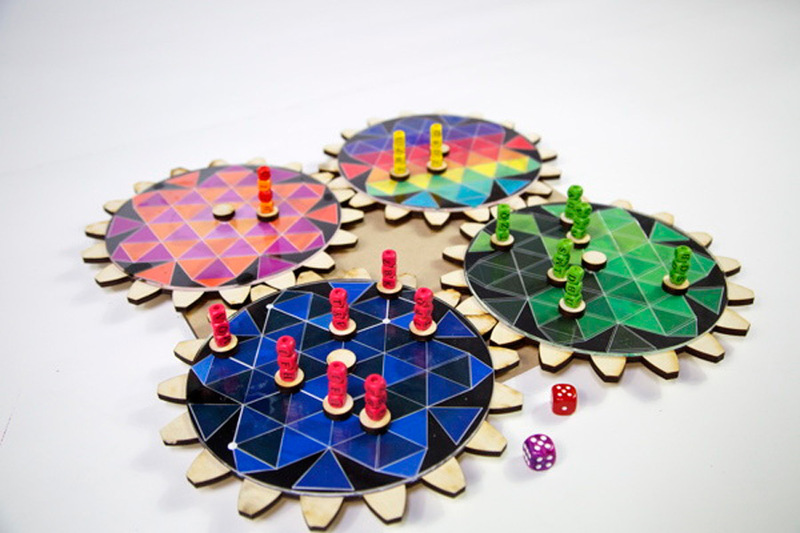 The game board is designed in the shape of gear. 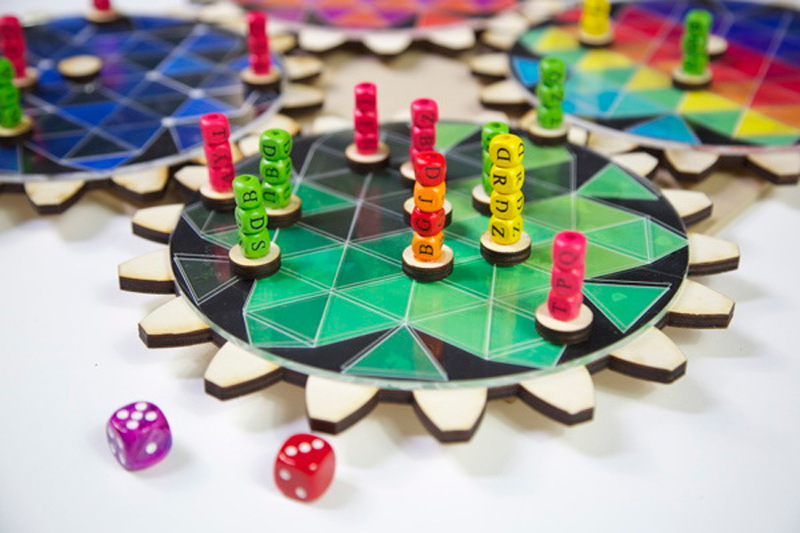 Players roll two dices in turn, and then rotate their own gears according to the sum of two numbers on the dices. Thus, the ‘gear’ rotation will subsequently change the position and distance between the game bits. We all know that the steps between your bits and your opponents’ are usually crucial to winning or losing, but the randomness of dice rolling leads to its unpredictability. It’s almost impossible for players to plan the next move, or think through a general strategy ahead of the game. It is always at the state of changing, so you have to accommodate your game bits formation constantly, get used to it, and make use of it. And that is why this game is called ‘Mystery Circus’. Wow this sounds amazing? Is this in production? I guess it’s still a prototype. Looks really amazing! 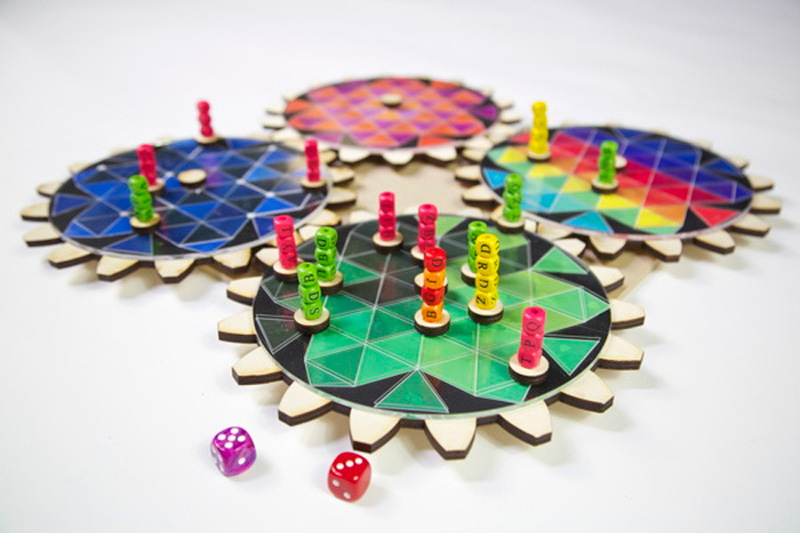 I love the board that rotates! Thanks! I am happy that you love it! 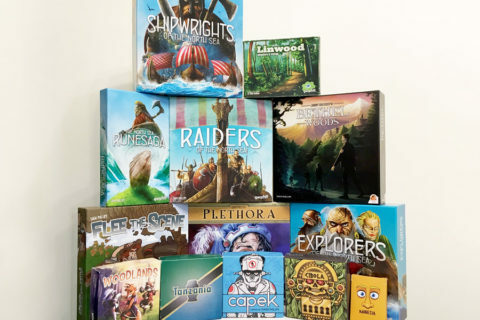 I provide the board game lending library, schedule demo reps, and in some cases provide play-to-win board games for eleven (11) conventions in our area with a total estimated attendance over 41,000 people. I also attend and organize many other community events, some examples include: weekly board game nights; scheduled demo events; community parties; convention staff events; birthday parties; fund raisers at local game stores; events at local libraries; Extra-Life 24 hour charity gaming event; and more. 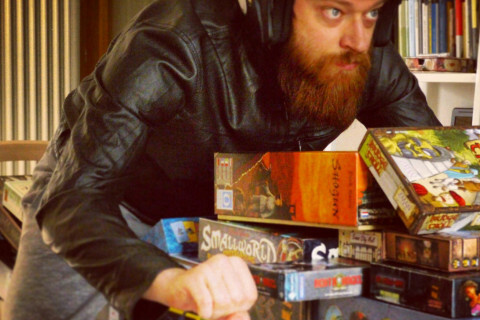 I am currently seeking games and gaming accessories to add to the primary lending library. I also have an adult section of the library which is only available to adult groups for after-hours programming and room parties. If you would like to send me copies of your games I would love to add them to the library. 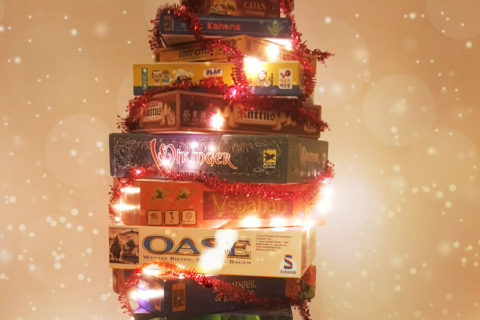 Since these games will be added to a traveling library and will be shifted around and handled by all sorts of people I would like to request that, if possible, you send games that you could not typically retail due to boxes damaged in shipping, dropped, scratched, etc. This way you are not sending a game that you could have sold and I am still getting to add the amazing titles to my library for players to enjoy. Thank you very much for your time and consideration of this request. More information can be found at http://www.facebook.com/gulfcoastpokemon/.